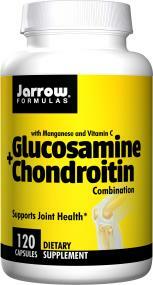 Glucosamine is a building block of hyaluronic acid, and is found in high quantities in the joints. Hyaluronic acid is synthesized by hyaluronic acid synthases (HAS), which covalently link monomeric N-acetyl-glucosamine, a derivative of glucosamine, and glucuronic acid in alternating fashion. It has been suggested that supplementation of glucosamine can stimulate hyaluronic acid production by supplying the rate-limiting substrate. Sulfated glucosamine, glycosaminoglycans, and polysaccharides, including chondroitin sulfate, are also thought to increase synovial hyaluronic acid production by triggering a hormone-like effect via binding to membrane proteins of synovial cells, although the precise mechanism is not well understood. Jarrow FORMULAS Glucosamine plus Chondroitin Combination is Joint Sustain nutrition with Manganese and Vitamin C.
Golden Milk is a mixable powder of delicious grass fed whey protein concentrate plus milk protein concentrate and coconut milk, seasoned with organic turmeric, cinnamon, organic ginger root and a hint of black pepper and It is a contemporary adaptation of the classic Indian home recipe of turmeric, milk, tea and spices enjoyed for centuries. Golden Milk invigorates the senses even as its spices warm the digestive system. Ingredients:Grass-fed whey protein concentrate, milk protein concentrate, coconut milk, organic turmeric, natural French vanilla flavor, cinnamon powder, black pepper, organic ginger root, sunflower lecithin and Lo Han Guo (Momordica grosvenorii). Jarrow Formulas Golden Milk is a mix powder of grass fed whey protein concentrate plus milk protein concentrate and coconut milk, seasoned with organic turmeric, cinnamon, other warm spices. No wheat, no gluten, no soybeans, no egg, no fish/shellfish, no peanuts. T Cell Formula 60 caps Ingredients per 2 capsules: Thymus (thymosin, thymic humoral factor, thymopoitin) 350 mg Lymph 250 mg Vitamin C 100 mg Other ingredients: Cellulose, Silicon Dioxide, Magnesium Stearate. This contains specially prepared fractions of thymus and lymphoid tissue. Derived from lamb. Suggested Use: 1 to 2 capsules per day, or as directed by a physician. Vitamin C from Tapioca 150 gmsformerly Pure Vitamin C 150 gmsDietary SupplementSupplement FactsServing Size: half tsp (2 grams)Servings Per Container: 75Amount Per Serving:Vitamin C (as Ascorbic Acid from Tapioca) 2000 mgDirections: Take half teaspoon in water or desired beverage, or as directed by a physician.This product contains absolutely no traces of corn antigen, and is hypoallergenic. This product contains no diluents, preservatives, binders, or excipients to insure maximal tolerance and absorption.Vitamin C Powder (from Tapioca) is a dietary supplement containing a highly purified source of ascorbic acid, comparable to reagent grade vitamin C. This hypoallergenic supplement is especially designed for these individuals with extreme food sensitivities who are not able to tolerate other less pure forms of ascorbic acid. Amazon A-P is a synergistic blend of 10 rainforest botanicals that have traditionally been used for harmful organisms in the gut. Each two capsules contains 1300 mg of natural herbs that deter many microorganisms. Take 2-3 capsules 2 times daily or as directed by a health care professional.